Bilsdale displays the classic Jurassic sequence. 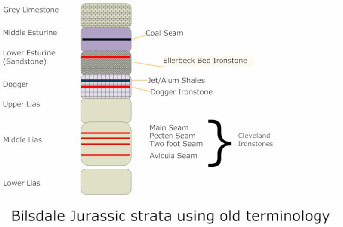 All three (Ellerbeck, Dogger, Cleveland iron deposits are present as well as jet and alum. The Cleveland Ironstone forms the valley bottom for much of the dale above Hagg End. Rievaulx lies some 30 miles north of York. Bilsdale is one of the main north-south valleys that cut the North Yorkshire Moors. Small nucleated settlements occur with numerous farms. 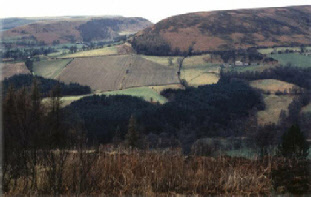 The valley is dominated by fields for pasture with some woodland. The upper slopes and tops are heather moorland. Bilsdale south end. Photo: Author.